In the top part of the subsequent screen, you can specify exactly which students you want to report on. 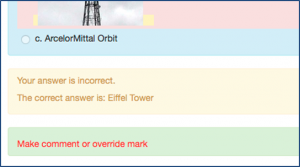 The default is enrolled users who have attempted the quiz. Make your selection, click Show report and scroll down the page to see results. 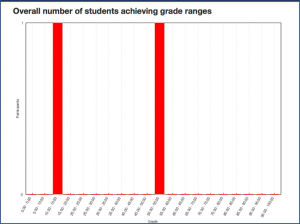 The results report provides a breakdown by question of how each student has performed on the quiz. You can scroll further down. 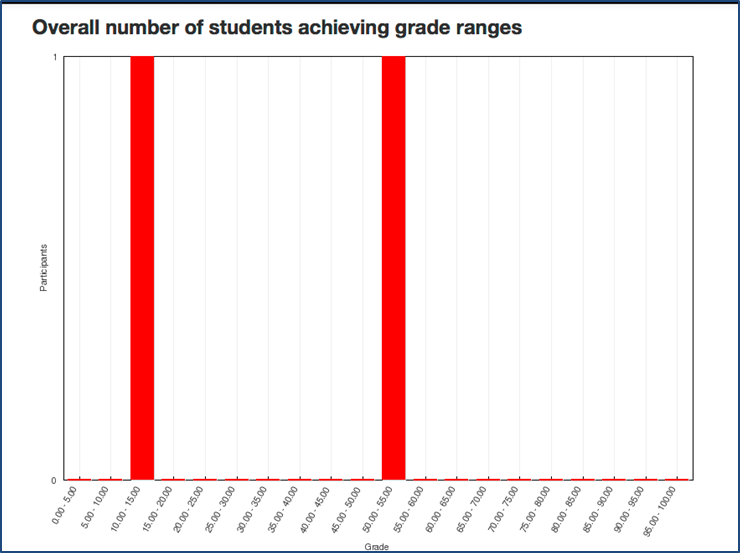 The final section shows the distribution of grades across the grade ranges. 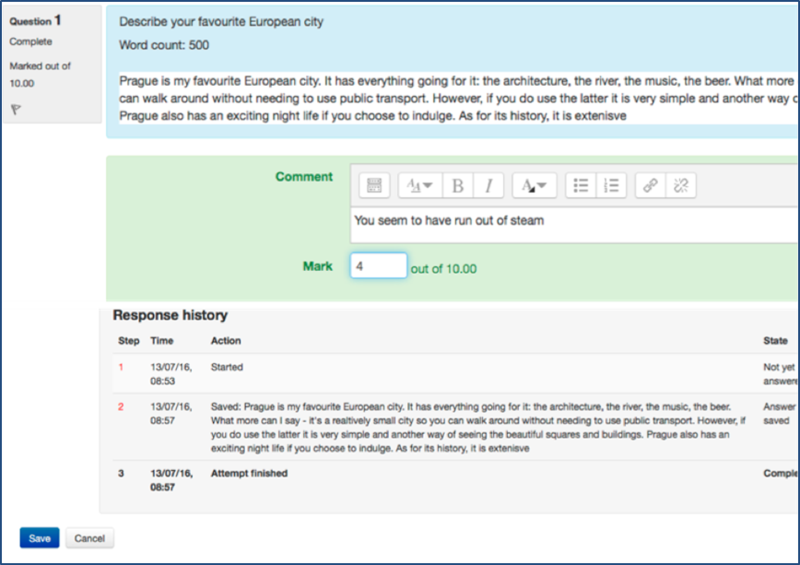 You can override the automatic grading on a particular student attempt e.g. because you did not anticipate all correct answers on a short answer question. You can also regrade all attempts e.g. because you have changed the scoring on a particular question and need to apply it to all student attempts. To override an individual attempt, select Review Attempt under the student’s name. 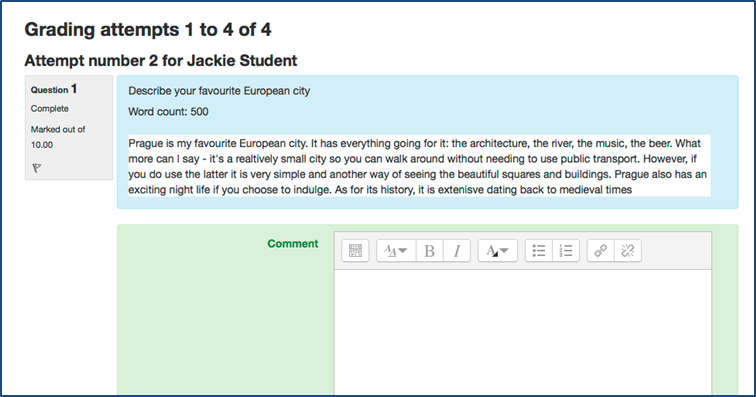 This takes you to the detailed version of their attempt where you can comment and override marks on each question as required. Remember to Save any changes. To leave the review screen, click Finish Review. The changes will be automatically reflected on the results page. 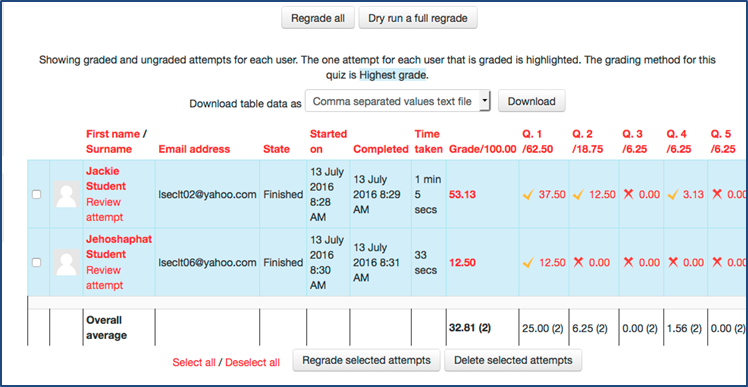 If you make a change to question grades that will affect all students who have already attempted the question, then use Regrade all (above the results) to apply the change. If you have Essay type questions, you will need to grade them manually. Essay questions will be designated as Requires Grading on the report. Select Review attempt. 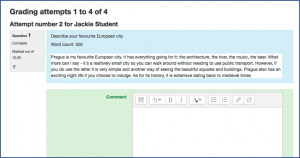 Scroll to the essay question and click Make comment or override mark. Make any comments and award a mark. Then click Save. Scroll to the end and click Finish Review on next screen. 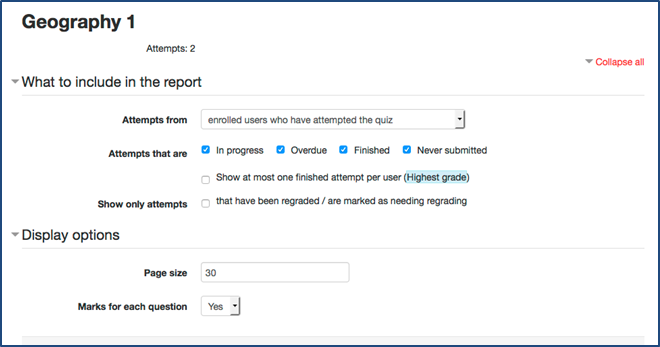 Then click Attempts:n to return to the Grades screen where the essay question mark is now showing and the quiz itself has been graded. When you have a large number of essay questions to grade, use Results/Manual grading. Click grade in the To grade column. This displays the submissions in a list (default is 5 to a page) for you to work through. Save and go to next page as you complete each page. 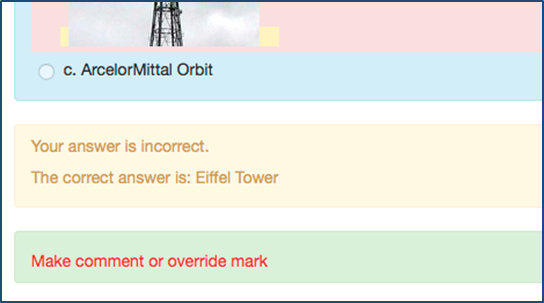 On completion, you will be taken back automatically to the list of questions needing grading which will now show 0. 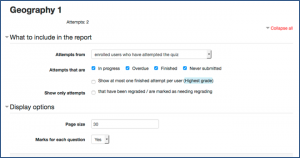 If you want to manually intervene in any of the automatically graded questions, click Also show questions that have been graded automatically. 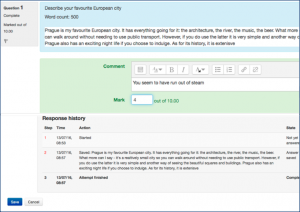 This enables you to check all attempts at a particular question and make any adjustments.